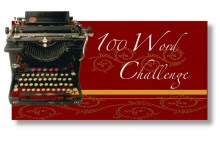 This week's 100 Words challenge over at Thin Spiral Notebook is HUNGRY. According to the cycles of daylight through the glass block windows, it has been five days since the storm. Five days we'd been trapped. The case of water was lasting, but the meager food supply was almost gone. The bucket I'd used for waste was beginning to reek. So was I.
I opened the last tin of potted meat with a skrrrrik of the lid. Daisy looked up at me with bright expectant eyes. My stomach rumbled furiously as I gave her the tin. She devoured it, tail wagging gratefully. "Enjoy it ... That's it." Help will come soon. I hope. I shot out of there like a scalded dog. Not out of shame or defeat, but because I didn't think I could contain myself any longer. And I didn't want to go to prison. I had been running for I don't know how long. I'd run until I couldn't see the lights. Until I couldn't feel the brutal impact of the ground through my legs anymore. Until broken glass shredded my lungs. I'd run and run and still could not escape myself. Could not escape my fury. I stopped. Cold blades shaved down my back and bled beneath the waistband of my pants. The ache in my feet caught up with me, sending flames up my legs. I raked the glass through my lungs some more. I looked up at the bruised sky. Fat, pea-sized drops hurled down, striking and banking around me. I had a flash of a memory, a spaceship's viewpoint of traveling at warp speed. For a second I felt my feet elevate, and then it was gone. I wondered if I waited, if I stood in this spot and stretched my energy as high up into the sky as I could, if I could draw a lightning strike to me. If I could will the unforgiving lance straight through me, through my heart and down into the aloof earth, taking my anger and sadness and spirit with it. Lightning sizzled my retinas, leaving only static in my vision as the thunder squeezed me in its giant fists. The rain was laughing, and I was still here. Several years back, while I was away on a girls’ weekend, Incrediboy came home from a local festival with a goldfish he had won in one of those ping pong toss games. I was less than pleased. I have nothing against fish, but I had fish in college and really didn’t care to go through the ordeal again. I glared at the Hub, who just shrugged and said he had no idea the boy would actually make one of the ping pong balls into its target. I was pretty annoyed that he couldn’t have steered him to a game with stuffed animals or pop guns instead. I had to admit though, the little drop of sunset orange with big moon eyes was pretty cute. I took Incrediboy to the local department store and we picked out a nice tank and filter set, some cheery gravel and an assortment of aquarium plants, along with a ceramic Spongebob Pineapple house with lots of windows for the little babe to explore and swim through. I had no idea how long “Flounder” would survive. Who knows how healthy those poor fair fish are to begin with. But if we were to bring an animal into the house, we were going to take care of it as best as we could. A few years ago Flounder changed from orange to shimmery white, in gradient blotches. Incrediboy was in a panic and I didn’t know what to make of it. With a little internet research I learned that goldfish often change color several times in their lives. I had no idea, did you? Flounder is now 5 years old. He has most recently turned a soothing blush tone - his body has quadrupled in size and his tail streams out behind him like a gossamer veil. The pineapple has long since been replaced with a rock cave, which Flounder enjoys hanging out in. Incrediboy adores him. Over the past few weeks, Flounder has not been himself. He hasn’t been moving much, and his fins and tail are beginning to deteriorate. He is losing scales near the base of his tail and is barely eating. We have been giving him some antibiotics in his tank water as suggested by the pet store, and change his water frequently to give him the most optimal environment. Most recently he seems to have perked up, but he struggles to swim and has difficulty staying straight up, listing to the side or flipping nose-up like a rocket on a launchpad. I don’t know if it’s due to his fins and tail being injured or if he is reaching the final mile of his road on earth. Incrediboy includes Flounder’s health in his prayers every night. Many people file fish in the category of disposable pets. They come and go, no big deal. But this particular fish means a lot to this boy. It will break his heart when Flounder moves on - and while I hate for anything to bring him pain, I appreciate that it will. Such a compassionate heart he has. It has been nearly six years since my last post. Wow. Is anyone still out there? I wouldn't blame you if you weren't. That's okay ... nobody was here when I started this blog either. So what have I been up to? All kinds of crap that hasn't been much fun. But some of it has. For one, a good friend of mine asked me to help him with a book project. We had a lot of fun with it - the story line was his concept and he had written it all out and I handled editing, rewrites and embellishments. There are now two novels out there and a third in progress. Pretty cool huh? All three of our fans are very excited. My friend brought his project to me, asking for my help. But in the end he helped me. I started thinking about writing again. I started thinking about how much I enjoyed keeping this blog and participating in the challenges and writing groups I found. I have decided to pursue a solo project. I have some ideas of what I want to do, and even have a few items to use for it. The problem is, my writing joints are stiff, my muscles atrophied. I need to start experimenting again. What better place to start than back at the beginning? I initially started this blog to help me work through my emotions surrounding the death of J, my dearest friend. Six years later, I am returning to its roots by writing about losing my father. It feels good to get thoughts and feelings down, even if it doesn't help me solve anything. The following is my contribution for Velvet Verbosity's 100 Words this week. This round's word is FORGOTTEN. VV is choosing very helpful words for my process. :). Thank you, my sweet readers, for your patience and compassion while indulging me. Appraising someone else's treasures is more difficult than you'd think. I struggle with evaluating and thinning Dad's beloved book collection, and glance at his sacred "ham shack" in the corner. The old amateur radios that used to whisper through the registers after my bedtime are now quiet until sold to other operators. The powdery ash that was once my Daddy will soon be one with the Rockies, assimilated and quickly forgotten by the elements. I've never been one to linger by caskets or gravestones ... but maybe that's what I'm doing now. Letting go so very reluctantly.